I was having extreme writer's block as to what I should write about today. I had a post planned that didn't go up, and I needed something to post. I instantly looked to my newsfeed to see what everyone else had been posting. I found a lot of July favorites posts and decided to jump on the bandwagon! 2. iPhone 6S: I had a Samsung phone for almost 2 years, but wanted to change to an iPhone before college so I could sync my calendar on my phone and computer(obsessive planner probs). I have been absolutely loving it, though my Samsung had more features I love how easy to use the iPhone is! What's on my phone is definitely coming very soon. Plus I got this super adorable Rifle Paper Co case! 3. Tank: I'm not going to lie I've been keeping my outfits very casual this summer. As a result, I have been absolutely loving this J.Crew Factory tank! It looks super cute while still being really comfortable. I've worn it way too many times to count this summer. 4. Moisturizer: I have been suffering from really dry skin this summer, but the Cerave moisturizer has been my lifesaver. It has helped keep my skin looking great even after long days in the sun. 5. Monogram Necklace: My monogram necklace is pretty much the only necklace I wear during the summer. It is perfectly paired with a casual tee and some fun shorts. It has definitely been my go-to accessory. 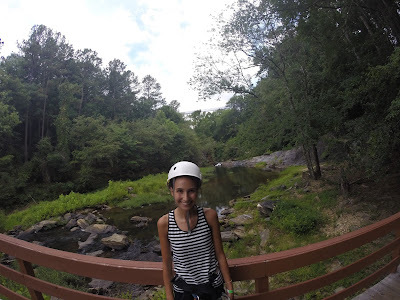 My favorite moment this month was definitely going zip lining! My dad and I went zip lining at Historic Banning Mills and it was so fun and something I will not forget. It was a good father-daughter trip before I head to college later this month. And flying through the air definitely satisfies your adventure itch. July was an awesome month full of memories and good times. From a week spent at the lake to my final days babysitting but I'm excited for August and the excitement that comes with moving into college and starting my freshman year! I love my monogram necklace as well! I've always wanted to zip line! Zip linning is so fun! This was my 3rd time, and it never gets boring. You'll definitely have to go sometime! Zip lining is on my bucket list! What a fun adventure!! It is so fun! Perfect bucket list item!